As you can see in this banner, Jan Ruth has written plenty of novels, although I have discovered her recently, quite by chance, on Facebook and Twitter. I was drawn in by her by her book of Christmas stories, Home for Christmas, which I read over Christmas, and I decided that I liked her writing style, so I went for one of her full-length novels, Midnight Sky, which is part one of the Midnight Sky Series, and I contacted her at once for an author spotlight, because I enjoyed it so much, but first my review. 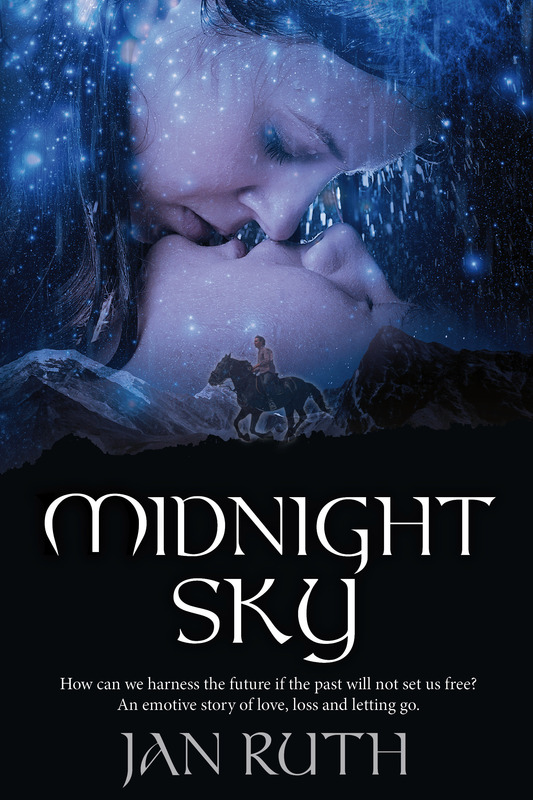 Midnight Sky is a contemporary family drama and romance, with touches of humour, which lighten some of the intense moments. The plot revolves around the lives of Laura, her partner Simon, and her sister Maggie’s family, on the one hand, and James, a brooding horse whisperer, who is dealing with many personal issues, on the other. I loved the setting, partly in Chester, but mainly in Rowen, a small village in the Welsh countryside, and the nearby beaches, farmland, cottages, country lanes and Victorian houses, pictured from freezing January, when the story starts, through to the warm summer, when the novel ends. It was also enlightening and heart-warming to watch James at work with his troubled horses on the farm. Laura is an interior decorator who works with her partner in a successful business. Life seems to be perfect, but really, Laura is stuck in a dead-end relationship with Simon, whose ex-wife and two children often seem to be more important for him than Laura. Laura would like to have a family, but Simon already has children, and this brings great conflict to their relationship. Laura’s sister, Maggie, introduces Laura to James’ sister Liz, and Laura and Simon are employed to refurbish their cottages. James is unfriendly at first because he’s against any type of change on his farm, and we’ll discover that part of the reason for his moody nature is that he is still mourning the loss of his wife, Cary, in tragic circumstances, two years earlier. I enjoy reading character driven novels, and there are plenty of lively and well-drawn secondary characters, such as James’ Bossy sister, Liz, and Maggie’s stoic and secretive husband, Pete. Another vibrant character is Laura’s niece, Jess, a rebellious teenager who has a crush on James, and provokes many of the hilarious situations in the novel, sometimes on the farm, where she helps with the horses, and often at the pub, leading to many memorable scenes! I highly recommend. It was a pleasure to read. Especially for lovers of romance, passion, and complex family relationships. I’ve read Midnight Sky and Palomino Sky, and I’m looking forward to book three, but could you tell us something about your previous novels? My previous novels stay with the family-saga theme; they’re a blend of rural and city, business and countryside, with the family dynamic central to the story line. I think my sequels (Palomino Sky and Dark Water) have steered away slightly from the original genre by bringing in a grittier thread as both books feature crime and some suspense. Your fiction has a very contemporary setting, how much of your novels, especially people and places, is based on personal experience? The places are real, they do exist! I think the characters are a cocktail of people I’ve encountered in my life. As a writer we tend to draw on experience whether consciously or not. Oh, and that goes for the horses and dogs too. 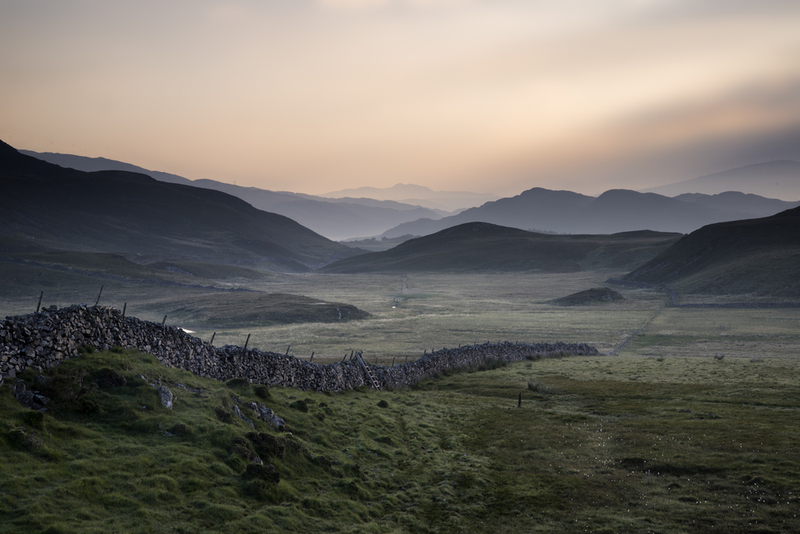 I moved from Cheshire to Snowdonia, North Wales, about fifteen years ago and it kick-started my writing in a big way. I love the landscape here and use it almost as a character in its own right. I know you’re working on part three of the series, when will it be published? What can you tell us about it? Is it the end of the series? I’m currently writing part three of the Wild Water series, Silent Water and yes, the end of that series. I think three is enough where the main plot line revolves around two characters coming together. I’ve read series where they’ve become too lightweight and watered down even by book two, or the original characters are forgotten and new ones take their place; sons and daughters of…etc. I don’t want to do that. I want to keep the three books tight and rich with story. Part three of the Midnight series will be Strawberry Sky… I do think there’s a lot more to come with James and Laura, Jess and Sam, Pete and Maggie. Their story isn’t quite complete. I’m hoping to start this one next year. Silent Water will be published spring/early summer. What are you planning on writing after the Midnight Sky Series? After Silent Water, my current work-in-progress, I’m liking the idea of a set of novellas called The Heart series.First consideration will be Christmas Heart. No, not a fluffy thing, you know me better than that! But it will be – hopefully – funny. I always find hiking groups full of eccentrics and believe me, I’ve done the research! So I have a vague outline around a walking holiday. And Christmas teams well with observational humour. Add some pathos and a few baubles along the way and I think I may enjoy this after writing two full-length, more serious tomes for the previous two years. And for contrast, I like the idea of Celtic Heart and Ancient Heart, exploring the idea of a historical time-slip. I recently wrote a post about the prejudice against self-published authors. You’ve had the experience of working with a traditional publisher and as an independent author, which would you say are the advantages and downside of both types of publishing? This is a huge subject, and each and every author will have a different experience so whatever I say here applies specifically to me and my material. I think there are still misconceptions about self-publishing, especially amongst the die hard traditionalists who’ve always had an agent or a publisher. There’s also confusion over vanity publishing and those self published books produced to a poor standard. The advantage of a small to medium size publisher is that your material will be edited and published for free. The disadvantages? Everything else. There is nothing a small publisher can do for you which you can’t do for yourself – and thus keep not only the royalties but full control over your material from the covers to your branding. I thought a traditional publisher would know more than me and therefore sell more of my books than I could by increasing my visibility with serious marketing. You’re very active on social media, especially on Facebook, where you manage a public group called Readers and Writers UK, how important are social media for writers? I suspect it as much about establishing support and sharing information amongst fellow authors, as it is to sell books. We’re selling on on-line product, so we need to be on-line, otherwise no one will discover our books! What would you like readers to know about you in a couple of sentences? I live in Snowdonia, North Wales. I write contemporary fiction about the darker side of the family dynamic with a generous helping of humour, horses and dogs. My books blend the serenities of rural life with the headaches of city business, exploring the endless complexities of relationships. You’re a very experienced self-published author, the most experienced I’ve ever had on my blog. Could you tell us about how you became a writer? The real story began at school, with prizes for short stories and poetry. I failed all things mathematical and scientific, and to this day I struggle to make sense of anything numerical. Many years later, my second novel, Wild Water, was taken on by Jane Judd, literary agent. Judd was a huge inspiration, but the book failed to find the right niche with a publisher. It didn’t fall into a specific category and, narrated mostly from the male viewpoint, it was considered out of genre for most publishers and too much of a risk. Amazon changed the face of the industry with the advent of self-publishing; opening up the market for readers to decide the fate of those previously spurned novels. I went on to successfully publish several works of fiction and short story collections and after a brief partnership with Access Press in 2015, I returned to the freedom of independent publishing. Fiction which does not fall neatly into a pigeon hole has always been the most difficult to define. In the old days such books wouldn’t be allowed shelf space if they didn’t slot immediately into a commercial list. 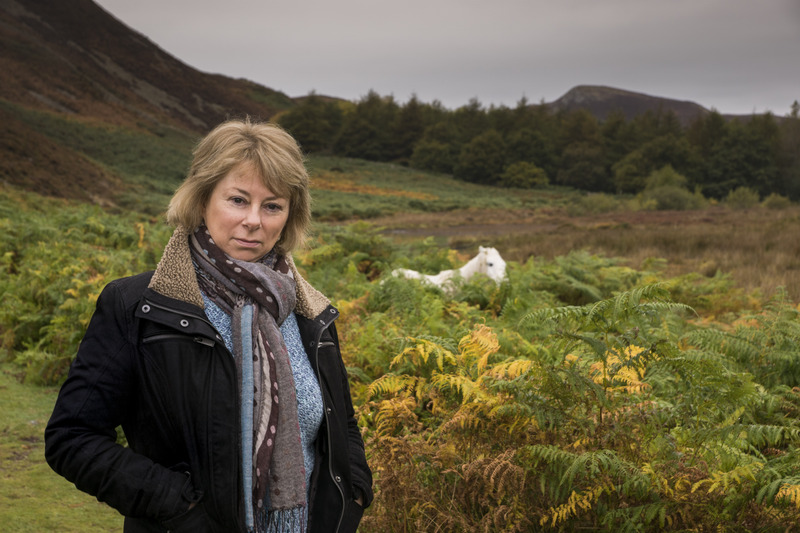 As an author I have been described as a combination of literary-contemporary-romantic-comedy-rural-realism-family-saga; oh, and with an occasional criminal twist and a lot of the time, written from the male viewpoint. How can readers contact you or find out more? Where can readers purchase your novels? Thank you for hosting and I’m both thrilled and motivated by your well thought out, in-depth review of Midnight Sky. It was a pleasure to read both novels. 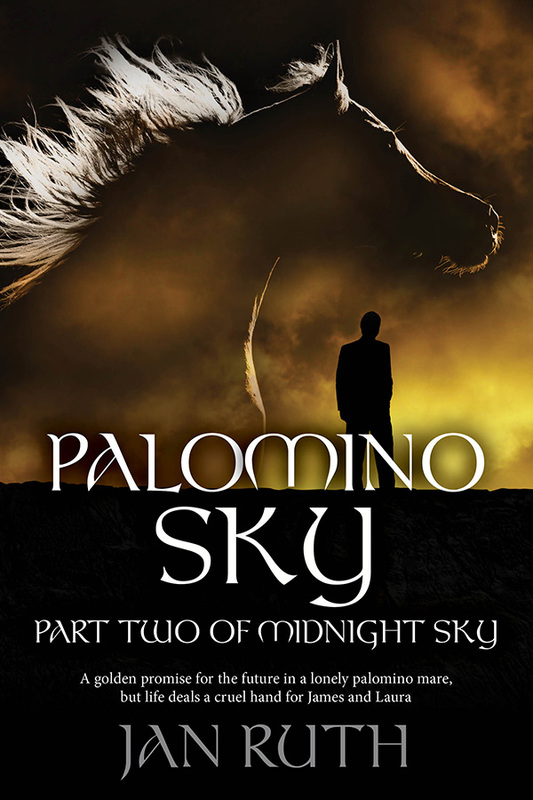 Palomino Sky review coming soon 🙂 I’m looking forward to book 3!